Do you love to keep fit? Or perhaps you're finally following up that resolution to get in shape? Whatever you're up to, a Tony Pryce Sports voucher code is a great way to save money on all your sports clothing and accessories. So whether you're looking for the perfect running shoe for your morning jog or a new racket for a winning streak on the tennis court, a Tony Pryce Sports discount code will help you get active for less. Tony Pryce Sports was established way back in 1978 to supply quality sporting accessories to dedicated sportsmen and women at affordable prices. Today, they are one of the largest independent sports retailers in the South West of England, with outlets throughout South Wales, Somerset, Devon and Cornwall. Based in the Somerset town of Minehead, Tony Pryce Sports specialised in providing equipment and footwear for everyone from serious sporting fanatics to fashion-conscious shoppers. Recognising the importance of established, reliable brands, their team has hunted down some of the very best in the world of sporting accessories. At Tony Pryce Sports' comprehensive online store customers can browse a fantastic range of sports products from premium sports brands including Nike, Adidas, Under Armour, Canterbury, Wilson, Kookaburra, Opro, Wacky Sox, TK, Grays and more. Products are available to search by category or by sport – making it easy to find everything you need. Love to get your blood pumping with a morning run? At Tony Pryce Sports you'll find everything you need to make your exercise more comfortable and more efficient. From comfortable running shoes to high-performance clothing designed to keep you warm and dry in all weathers, there's something to suit every budget and taste. Or perhaps you love to play tennis, badminton or squash? As well as clothing and accessories, Tony Pryce Sports stocks a wide selection of rackets specially selected to help you get the most out of your game. Unsure what you're looking for? The team at Tony Pryce Sports have extensive knowledge on a wide range of sports and fitness activities, and will be all too happy to help and advise you on which products are best suited to your needs. They're also experienced in kitting out entire clubs for a variety of sports, so they're an ideal choice for schools or groups too. Want to get shopping with Tony Pryce Sports? With a Tony Pryce Sports voucher code you can enjoy fantastic savings on their wide range of sports and fitness clothing, accessories and more. So whether you're a keen sports person or just getting started, a Tony Pryce Sports discount code will save you money while you shop. Wide range of sports and fitness clothing and accessories. 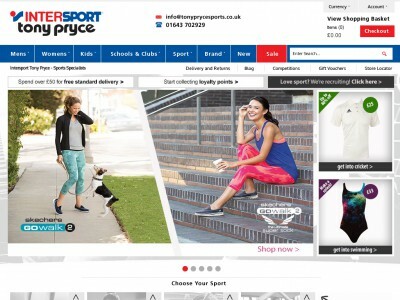 Browse our website until you find a Tony Pryce Sports discount code that suits you, then navigate to their website to begin shopping. When you're finished shopping, click 'Secure checkout'. Click to apply your Tony Pryce Sports voucher code. Want to find out more about getting fit in style with Tony Pryce Sports? Why not pay a visit to the company's dedicated YouTube channel? You'll find lots of exclusive content including workout tips, product reviews, sports interviews and much more. You can also use this channel to find out more about saving money with a Tony Pryce Sports discount code. If you've enjoyed shopping with Tony Pryce Sports, you might also like to check out more great deals on sports equipment and more at stores like Sports Direct or JD Sports. Or, if those aren't up your street, you'll find plenty more deals to browse in our Sports section. Standard UK delivery is £3.95, with options for next day delivery for a small fee. If you need to return a product for any reason to Tony Pryce Sports, you can do so by simply returning your items in their original condition within 28 days of the dispatch date. Need to speak to the team at Tony Pryce Sports? Whether you have a question about your order, want some expert advice on choosing the right products or just want to find out more about how you could make big savings with a Tony Pryce Sports voucher code, you can contact the Customer Services department by telephoning 01643 702929. Want to discover more from Tony Pryce Sports? Why not follow them across your favourite social media networks? You'll enjoy access to lots of interesting content including competitions, promotions, fitness articles and more. You can also use these pages to find out more about saving money with a Tony Pryce Sports discount code. Don’t forget to check them regularly, as you can never be sure when a free Tony Pryce Sports voucher code might be waiting for you! Buy now online at www.tonyprycesports.co.uk. My son is just getting into football, but all the kit can be so expensive. Luckily, I found a Tony Pryce Sports voucher code online. With a Tony Pryce Sports discount code you can get great deals on a huge range of sports clothing, equipment and accessories at tonyprycesports.co.uk. I used my Tony Pryce Sports voucher code to get a fantastic price on some football boots for the new term, so he's ready to start shopping for less with Tony Pryce Sports voucher code!